What is the fit difference in Juniors & Womens Apparel? Selecting the right category of apparel is really important in choosing a garment that will fit your group. Juniors Apparel – typically recommend for smaller/younger women. If you want something quite fitted, this is the way to go. Below is a little guideline for you to go off of, but you’ll need to check the size chart based on a per item basis to get the actual specs. The fit of these is going to be similar to what you would find at Abercrombie, Hollister, or Victoria Secret Pink. We typically recommend sizing up 1-2 sizes on Juniors fitted apparel. Women’s Apparel – this is the traditional fit that most women are looking for. Something that’s a little bit more flattering than a basic tee, but nothing too fitted. These are going to be for the more conservative women that doesn’t want all of her bumps and curves to be hugged. Below is a guideline, but be sure to check out the size chart of the specific garment you are interested in purchasing. The day of women wearing a plain ole boxy tee are over! Women are wanting something more flatting, more fitted and something a lot more stylish than that. With over 1,000 customizable ladies apparel options, we’ve got something for everyone. 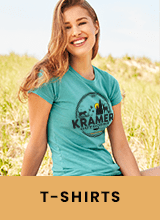 Choose from standard ladies crew neck t-shirts, womens v-necks, ladies corporate apparel and much more to find the right garment that fits your style. To really make your look professional, add embroidery. 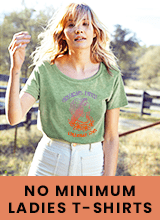 Want a basic t-shirt, check out our no minimum custom t-shirt selections.